The Cloud is an ozone free air purifier that combines six (6) different filtration methods to eliminate 99.99% of all indoor pollutants. Rocky Mountain Air® specifically created the Cloud air purifier to serve as an ozoneless alternative for smoke-free environments that are frequently occupied. 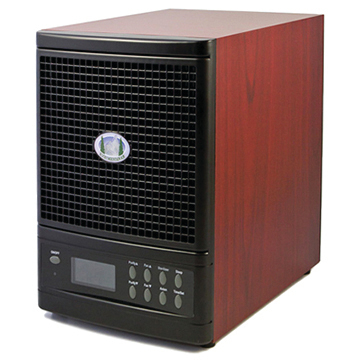 In fact, the Cloud is the ideal air purifier for offices and can be run continuously to ensure the air you breathe is as fresh and clean as the Rocky Mountains. The Cloud is able to meet such lofty expectations by combining HEPA, Ionic, Photo-Catalytic, and Carbon Filtration with Ultraviolet (UV) sterilization to provide layer upon layer of protection against allergens and other airborne contaminants. By using different filtration methods to attack impurities in the air from multiple angles, the Cloud is able to quickly transform the air in your home or office. The difference our air purifier can make is simply undeniable! We are so confident in the quality of our product that we have backed the Cloud with 60-Day money back guarantee and 3-Year warranty. So if you're in the market for an ozone free air purifier, look no further than the Cloud to deliver Pure Rocky Mountain Air®! Shipping Weight: 15.5 lbs • Coverage: 3,500 Sq. Ft.
Six Stages Of Purification: Dust & Debris Pre-FilterOur Activated Pre-filter begins the multi-stage filtration for all Rocky Mountain Air® purification systems. By trapping and filtering out coarser contaminants, the initial phase of filtration effectively removes dust, dirt, pet hair, and debris from the air you breathe. As a result, less stress is placed on each of the following filtration stages making your portable air cleaner more effective and durable. The first step in our filtration process is just as important as the last and so Rocky Mountain Air® made certain to create a Pre-filter that is easy to clean and as durable as the unit itself.